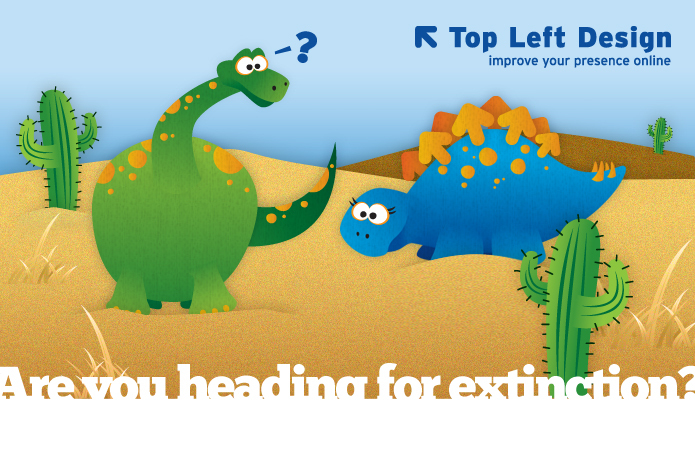 Top Left Design April 2012 News - Are You Heading For Extinction? Even here at TLD we sometimes find things a bit overwhelming. It's our job to keep up-to-date with what's going on in the world of design, social media and marketing - in fact it's one of the reasons we use owls in our branding! So if you are feeling left behind - the pressure is on us all. But let's take a bit of a reality check. Nowadays, if you are in business, you have to be showing yourself as the best person for the job. Other people are doing this, and you need to be able to stand next to them and look like you are up to speed, up to scratch, and moving up in the world! Your website should also have a blog. Blogs help you build confidence, express your company's personality, increase traffic and conversion, share your company news and keep yourself out there in the minds of your audience. The only drawback? You have to keep it up to date consistently - and always improve your blogging skills. If you are human, you need to be on LinkedIn - properly. Must haves are: a cropped headshot profile picture, your personalised URL, and your summary, written in the first person so it shows your personality and why you love your work. Choose one other social network. - the one you want to be active on - so you can really give your online activity a little bit more "ooomph" and build your relationships. This compliments the "face to face" and leads to MANY more opportunities!! 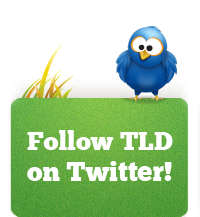 So what else is happening at TLD? Following the news that Tina is going to go travelling around the world for a year, we wiped away the tears, took a deep breath and asked Aric to come join the team. He started with us in April and Tina is putting him through all sorts of guerrilla training on the TLD ways! 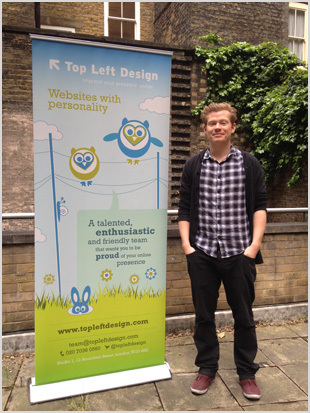 Here he is (pictured left) with our new TLD popup banner - one of his first design projects. Aric has been a friend of the company for a while, he came in to help us out when things got busy last year. A brilliant designer and wonderful guy, we decided we had to keep him. No, not the silver haired former film director - but our very own Michael! 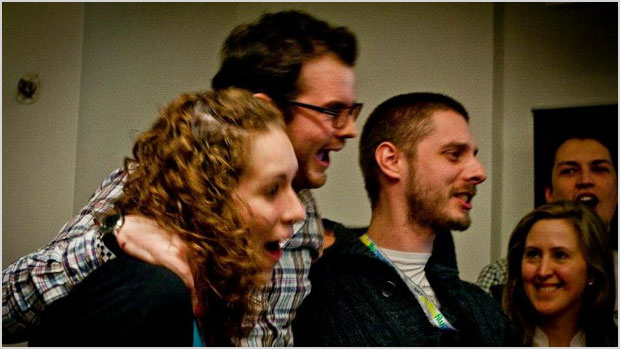 He recently took part in a 54 hour 'hackathon' event at Google's new Campus co-working space in Shoreditch, and won! His team of four went up against 140 other participants to conceive, plan, and create a startup over a long weekend of designing and coding. They came up with 'pollarize.me', a social polling tool which allows people to create questions with two possible answers, push the question out to all of their social networks, and gather feedback and results in one place, visually represented by a pie chart. Read all about it on Michael's blog post about the experience! 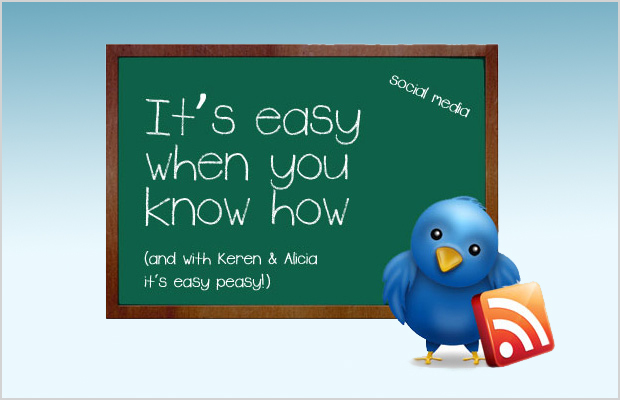 Keren and Alicia Cowan teamed up again to run an amazing social media seminar. You can check out the Timelapse video that Michael made on the day here! The famous seminar - entitled "Social Media - Can you afford to ignore it?" is now going on the road - first stop Brighton. Esme and Emma from My Special PA came along to December's event and then Alicia, Keren, Esme and Emma got together at Soho House (where magic happens) and in a follow up Skype call, cooked up the details of the Brighon Event. 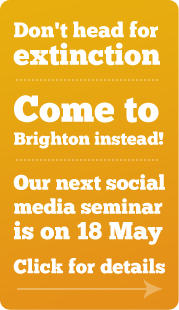 There are still early bird tickets - you can read all about it and book in here - and if you are London based - Brighton isn't that far (it's closer than some parts of London) - and it's such a lovely part of the world! Keren travels far and wide - 4 days in Lake Como and next week - Singapore! 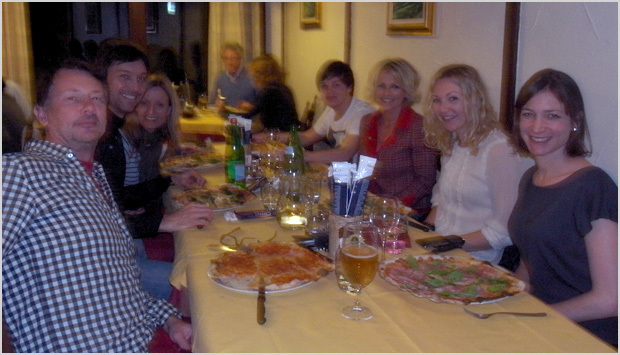 Keren went off to Lake Como with Alicia Cowan for a 4 day trip to advise the team at Lake Como Wedding Planner. It was an incredible trip - with content planning and blog headline brainstorming, Facebook strategy and an introduction to Pinterest - all mixed in with Gelato and cappuccinos. Amazing. Read all about it on our blog. Next stop for Keren (before Brighton) is Singapore - to speak at 2 events: Business Rocks and Athena Cappuccino Connections Singapore. The trip is organised by our client Gina Romero, the founder of Athena Singapore and Unconventional Business Thinking - and there is a packed itinerary of meetings and events next week. "I am SO EXCITED" says Keren, "and I will of course be tweeting from Singapore so keep in touch on Twitter". Suzy Dallas is a trusted interior designer and advisor to her international clientele. She has studios in both London and Hampshire and uses her unique design skills to interpret what her clients want and need for their homes. Suzy wanted to showcase her Dallas Essentials and Suzy Dallas Interiors services. We of course included a blog and the latest headlines feed to the homepage. On the portfolio page we also have a gallery powered by Flickr. 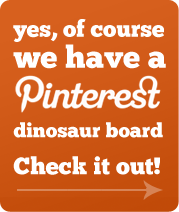 The site includes a link to her Pinterest board as well. It was a pleasure working with Suzy on this project and we really enjoyed looking at her unique design work. Legacy Portfolio had their website created by us in 2010 and recently came back to us to revamp their blog. They wanted their blog to look and feel more creative with a fresh new design. It was important to make sure the new design style was still in keeping with the existing website. We've used the same colours which are used throughout the rest of the site, however introduced fresher pastel shades of blue and red and a new script font. Along with their new blog design we also revamped their newsletter to match the design of the new blog. We created three templates here which allow Legacy Portfolio to easily edit and send their own email communications, whether it is a blog update, press release, or their latest news! They were able to translate our rough ideas and thoughts into creative and innovative designs and gave us some really fab recommendations. TLD ensured that our newsletters and e-shots were in-keeping with the blog's theme and trained us so that we are able to send out the newly designed newsletters whenever we needed. We love the end result particularly our beautiful social media tabs and the new 'about the bloggers' section. Re-designing our blog has been a really valuable process and will hopefully encourage us to make sure the content is as fabulous as the design! Back in 2011 we launched a website along with our good friends A Business Innovation for their client Dragonfly Planning. They wanted a small but clean and professional website with strong images targeted at wealthy private clients. Given the small size of the site, the team at A Business Innovation created a series of client case studies which we added as downloadable PDFs. This year they decided to move forward with a blog (which as you know is something we think all our clients should have). We made sure the blog matched the website seamlessly. It's neat, clean and we just love the big strong images they have elected to use in the posts. It also makes use of a calendar and an RSS feed to ensure that their clients always stay up-to-date. We also recently created a lovely holding page for their sister company Dragonfly Trust Services. We hope you have enjoyed our news - make sure you DO NOT MISS our blog post, also entitled - "Are you Heading for Extinction?" as it really is fantastic. This way, you are sure to survive the apocalypse - and we'll see you on the other side.